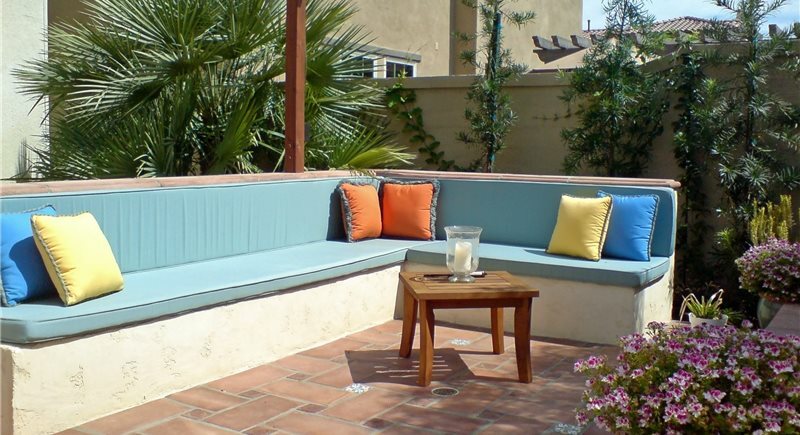 Good design made it possible to fit a variety of outdoor living elements into the small outdoor space. 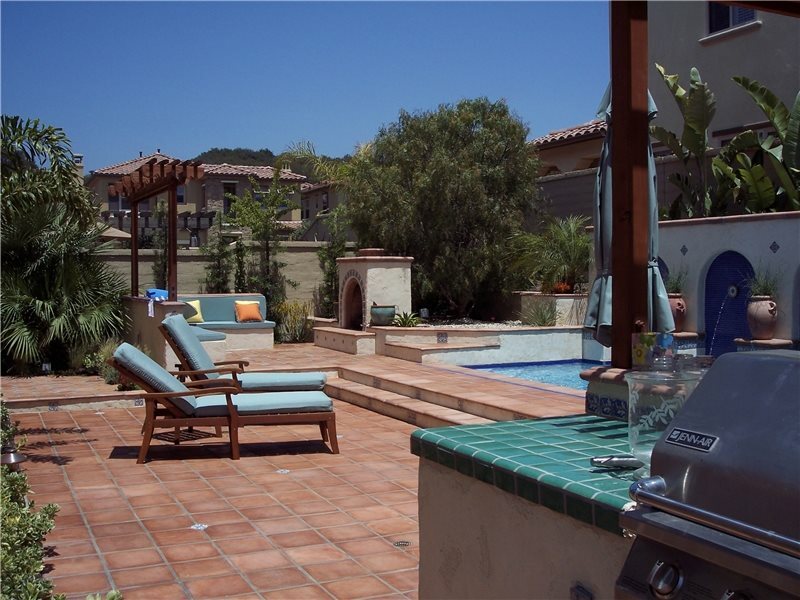 The view of the beautiful backyard from the barbecue area and redwood-trellis-covered dining area overlooking the pool. Mature banana trees provide a green backdrop. 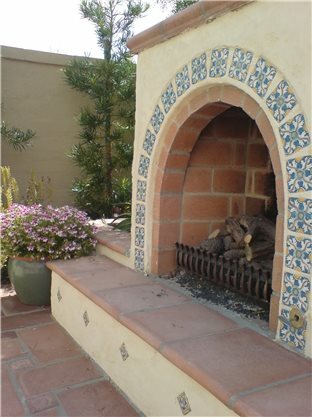 A picture of the gas fireplace adorned with hand-painted 4-inch tile from Sevilla, Spain. 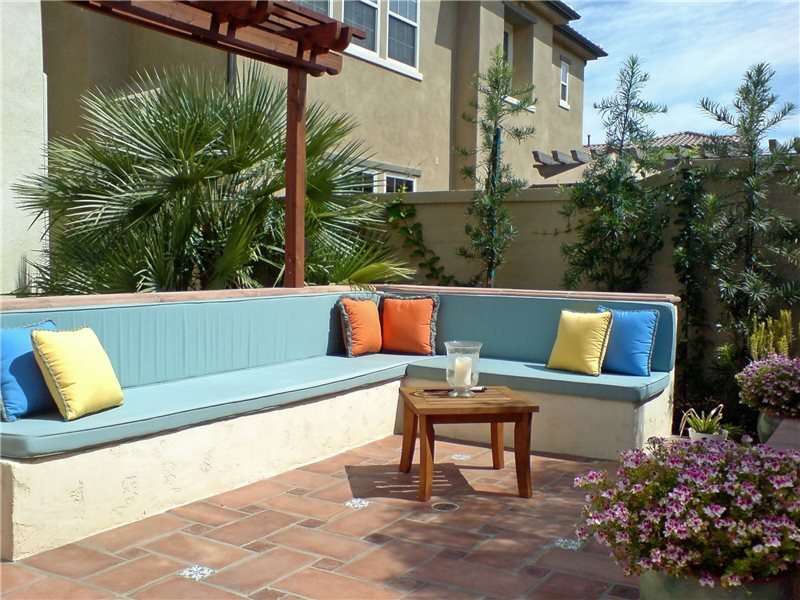 The built-in fireplace seating, covered with colorful cushions and pillows, is constructed of masonry block with a stucco finish. 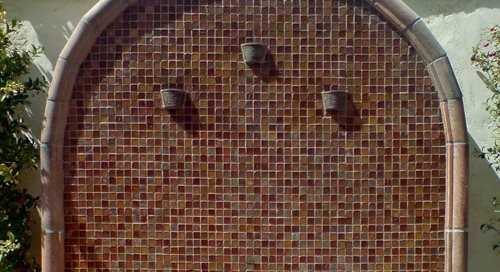 The terracotta paving is accented with hand-painted ceramic tile. 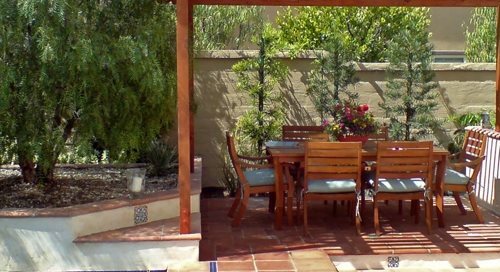 The outdoor dining area is shaded by a redwood trellis and looks out upon a mature California pepper tree (left). 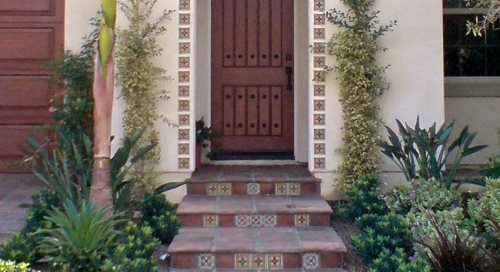 The inviting entrance to the home now welcomes visitors with a stairway of terracotta pavers, accented by decorative ceramic tiles. 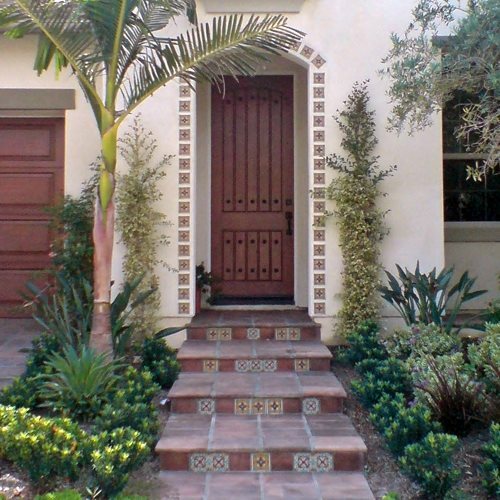 Tropical plantings add instant curb appeal. 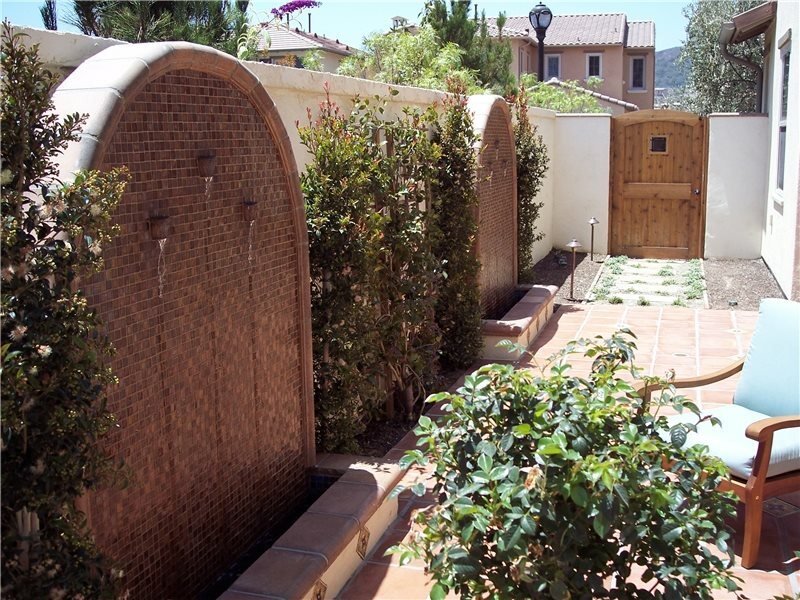 The arched water features in the sideyard, made with a custom blend of ½-inch glass tile. A close-up of one of the sideyard water features, showing the three spouts where the water cascades from. View from the sundeck area overlooking the reflective pool. 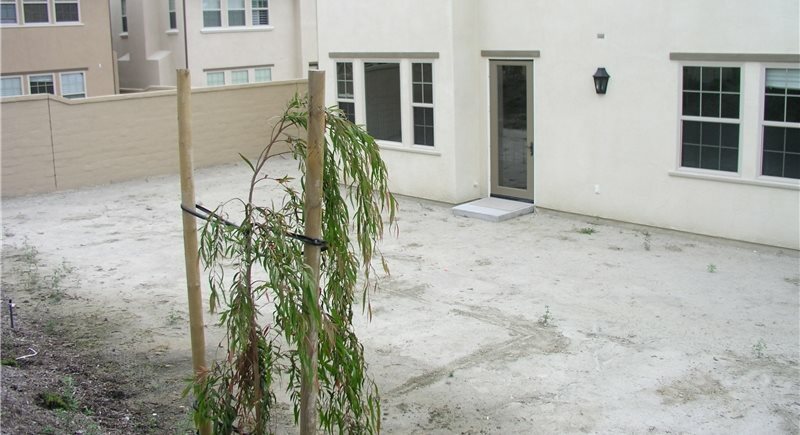 The home's barren backyard before transformation into a beautiful Spanish-style outdoor retreat. The lush Mediterranean-inspired landscape surrounding this new house in the gated Talega community of San Clemente, Calif., is right at home in a town known as the "Spanish Village by the Sea." 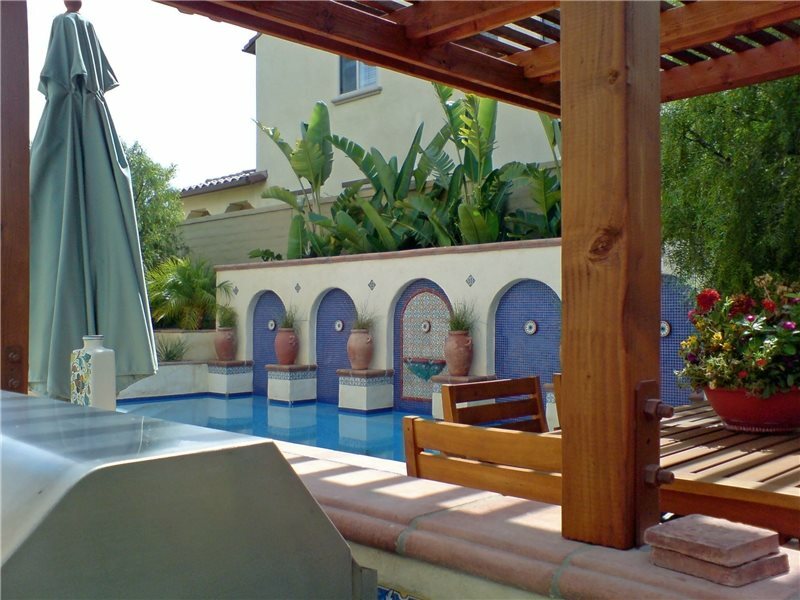 The owner had a small lot that she wished to transform into an outdoor space reminiscent of Sevilla, Spain, a place she loves and travels to frequently. In her very limited space, she wanted to incorporate a pool and spa, a backyard water feature, a built-in grill and outdoor dining area, a fireplace, a sundeck, and an entertaining area. She also wanted to give the stark entryway to the home much-needed curb appeal. 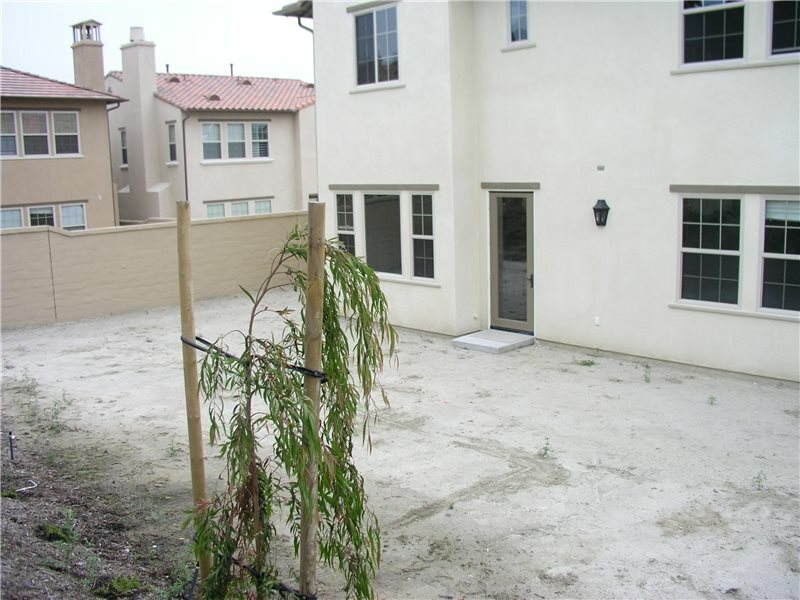 Learn more about small yard landscaping. 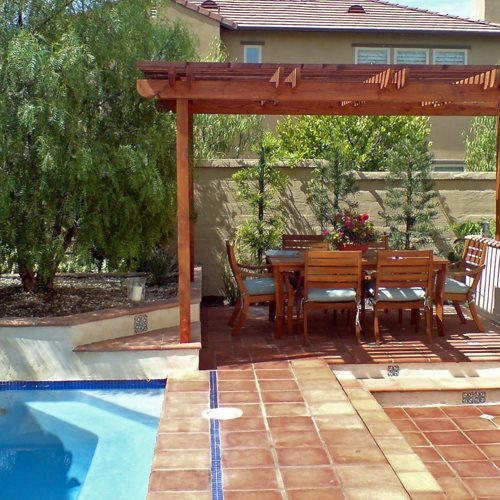 Get more backyard makeover ideas. 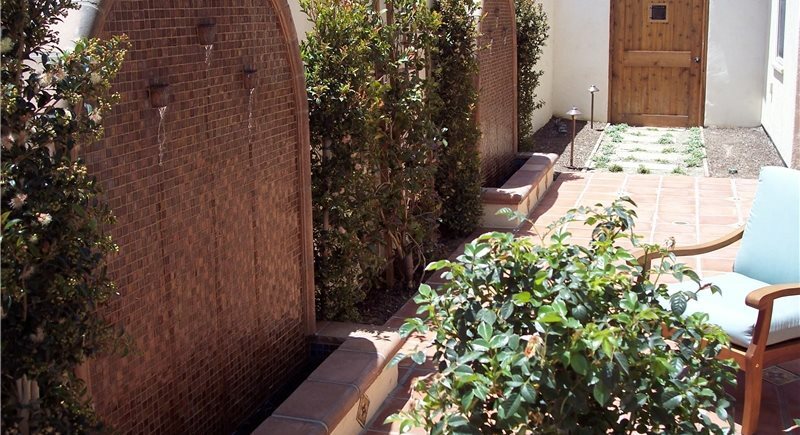 Warwick Powles-Hunt of Studio H Landscape Architecture, a landscape design-build firm in Newport Beach, Calif., drafted a site plan that satisfied all of the client's ambitious goals. "We decided to create a splash pool/reflecting pool/spa/fountain combination to maximize the use of the space," he says. 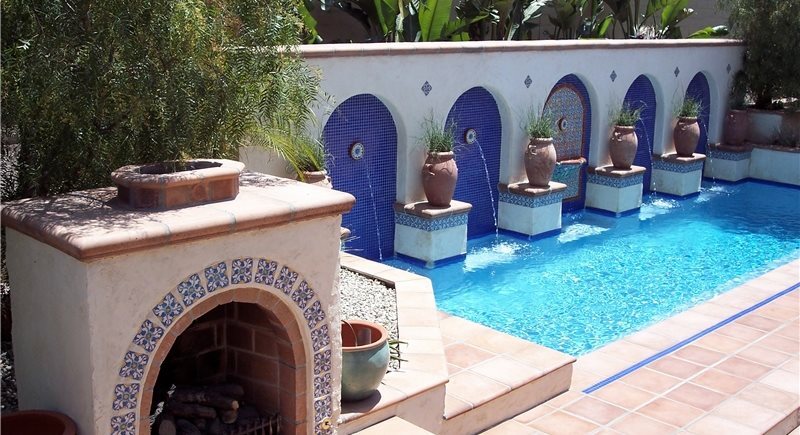 "The backside of the pool includes a large raised bond-beam with classic recessed Spanish-style archways with glass tile and a smooth stucco finish. 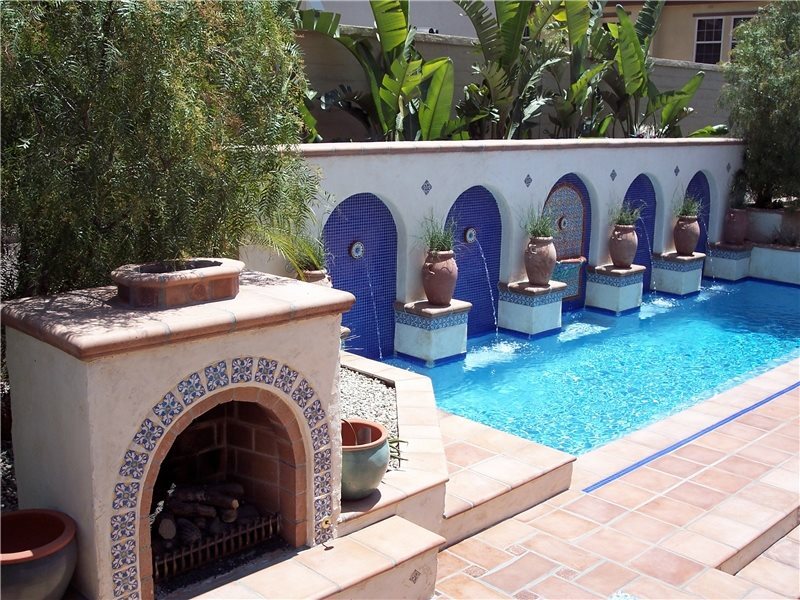 Within each archway are individual spitters that shoot water into the pool. 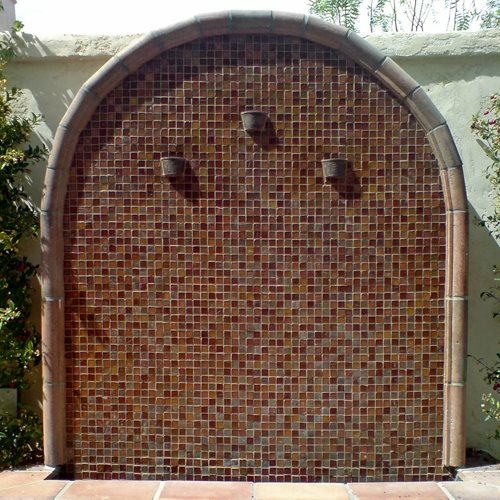 Attached to the center archway is a custom-made decorative bowl designed by the client and built locally." 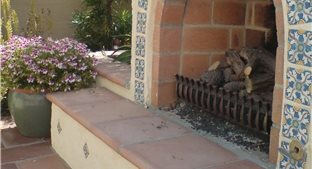 A gas fireplace with a terracotta hearth cap and hand-painted tile selected by the client on a visit to Sevilla. 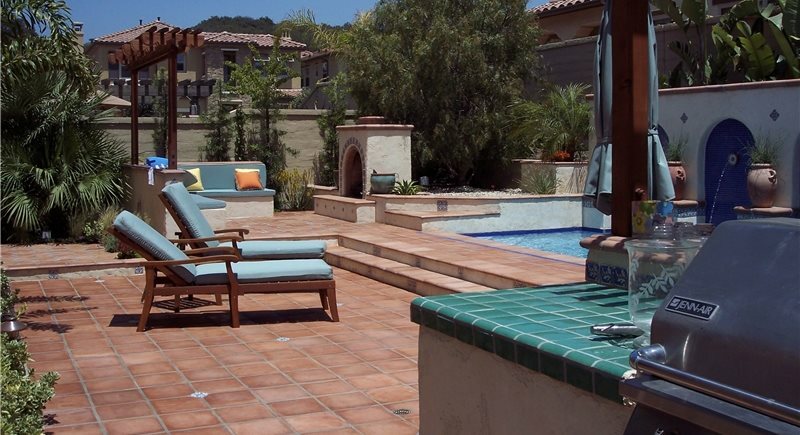 A fireplace seating area with built-in benches, custom-made cushions, and terracotta paving with hand-painted ceramic tile accents. An outdoor dining area shaded by a redwood trellis. Entrance steps paved with terracotta and decorative ceramic tiles. 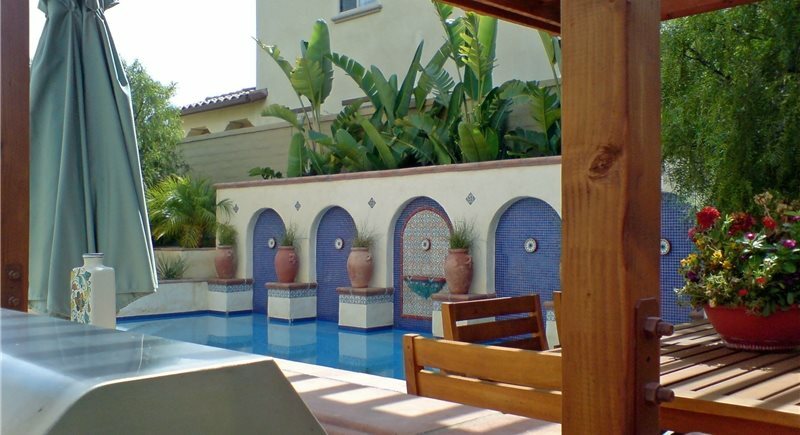 Arch-shaped water features in the sideyard, accented with a custom blend of ½-inch glass tile. A terracotta-paved sundeck overlooking the reflecting pool. The homeowner plans to use the space as a private retreat for entertaining family and friends. Collaborate with the client. "Both the client and I had a similar vision for this project, and together we were able to massage the design during the construction process to achieve a result that is elegant, functional, unique and on budget," says Powles-Hunt. Provide value for the dollar. Studio H uses several strategies to maximize the client's investment in their landscaping. They often build projects in phases, as the client's budget allows, they research the current market value of the client's property prior to starting the design to assess the appropriate budget range, and they make curb appeal an important element of each design. Studio H also uses customized calculators and Excel spreadsheets with detailed unit pricing to estimate construction costs. Focus on sustainability. Studio H has seen a greater demand for sustainable landscaping design that incorporates such elements as low-water-use plant material, LED lighting, drip irrigation systems and recycled materials. "Clients are feeling more of a responsibility to the environment, and the pricing has dropped low enough to make installing LED lighting, drip irrigation and other sustainable products more of an economically viable investment," Warwick explains.